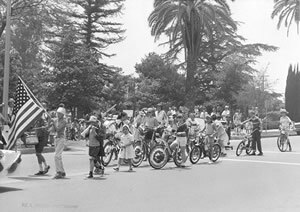 4th of July Parade at the intersection of Hermosa and Sierra Madre Blvd., circa 1970. Joe A. Hinojos Collection, Sierra Madre Historical Archives. Click the photo to view more historical photographs from the Sierra Madre Public Library's Flickr account. Explore your own family history using Ancestry.com - The world’s largest online family history resource, with 7 billion genealogical records from across the globe and millions of family trees. Access limited to in Library use only. Our local history collection consists of a variety of materials that tell the Sierra Madre story: photographs, slides, postcards, scrapbooks, city directories, maps, letters, periodicals, posters, works of art, sound recordings, moving images, and ephemera. Selected items are accessible via the Library's online catalog. The local history collection is built on a partnership. It is jointly owned and maintained by the Sierra Madre Historical Preservation Society and the Sierra Madre Public Library. Portions of the Local History Collection are located in the California Room at the Sierra Madre Public Library. Some items are available for research and viewing, however, scheduling an appointment is recommended. Call the Library at (626) 355-7186 to schedule a visit, or send an email to localhistory@cityofsierramadre.com. California Listens Project for Sierra Madre - NEW! Timeline: Headline History of Sierra Madre features events of note by decade. Sierra Madre Landmarks Information about local historical landmarks.